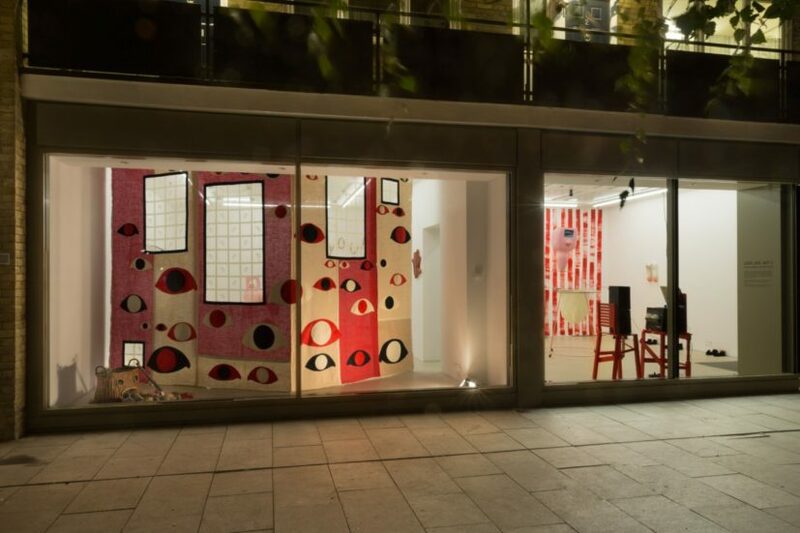 Approaching PEER you can’t miss the large eyes that welcome visitors to Jonathan Baldock & Emma Hart’s Love Life: Act 1, a touring exhibition in three acts that engages with the histories and traditions of Punch and Judy shows. Originally inspired by Italian Commedia dell’Arte, this popular puppet theatre appeared in England in the 17th century and became a familiar feature of street and seaside life from the 19th century onwards. They remained a prominent part of British seaside entertainment throughout the 20th century and marked the childhood experiences of Baldock and Hart. Basing their collaboration around the domestic drama of Punch and Judy brings a rich and magical world of childhood pleasure to this work, but also the senseless and maniacal violence which features in so much of what children are encouraged to laugh and cheer about. The series of works presented at PEER are homogenous and repetitious in presentation, making the viewer wonder who has authored which, or where one ends and another begins. Fittingly, this is not the first time the two artists have worked together. 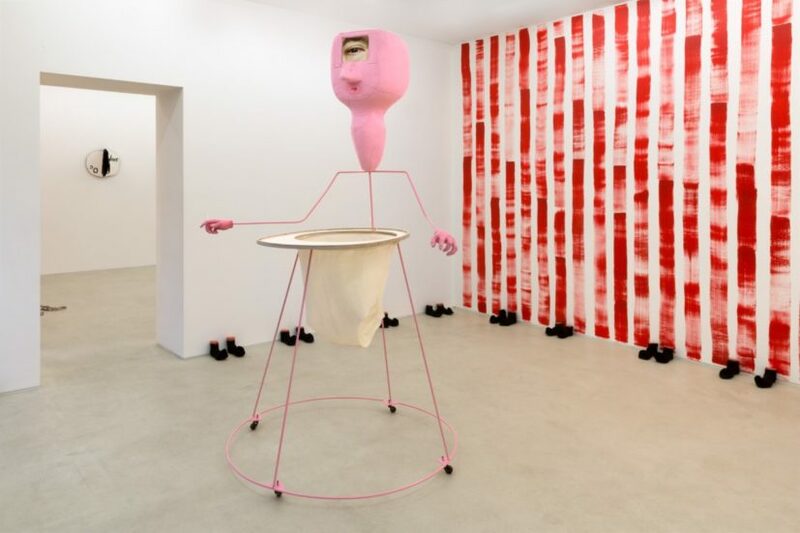 In 2015, at l’étrangère gallery, they staged a fictional dinner party that gathered their common interests: the grotesque and the surreal; the domestic and the handmade; the human and its excesses; the peculiar relation between violence and humour. 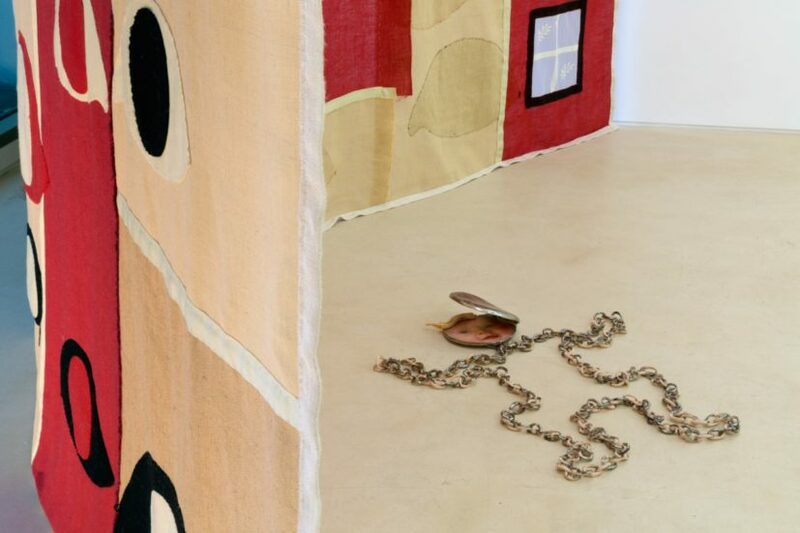 For PEER the Punch and Judy-themed show seems a perfect platform through which to explore these themes, especially the dramatic tipping points that force everyday situations into moments of violent excess. The space we enter is pervaded by a certain tension, created by a giant one-eyed baby in a baby walker, recalling the monstrous infants of popular horror film or the classical tradition of Polyphemus. The walls are unevenly striped in the red and white of a seaside sideshow, contributing to the deranged sense of a haunted house the owners have abandoned. 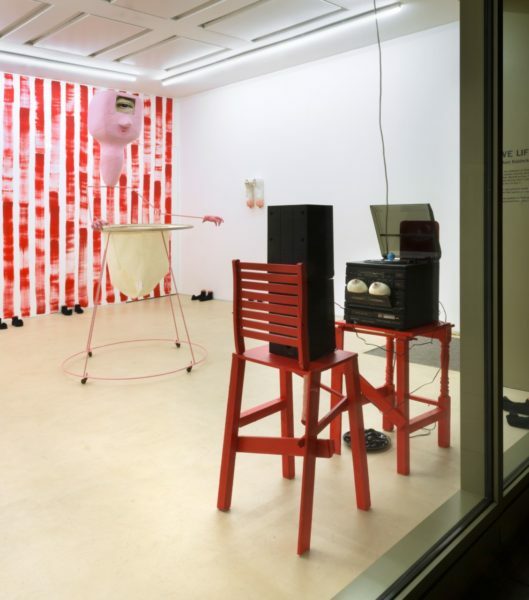 Ceramic ‘nagging’ feet with black socks are lined up around the edges of the room and are joined by a pair of breasts that, as if squeezed from tubes, hang from the wall. In the background, the artists have recorded a version of Stan Freberg’s 1951 parody, John and Marsha. Their riff on this classic comedy – Jon and Emma (2016) – is rich in melodrama to show how every human emotion can be incorporated into domestic life. In the next gallery, a baby in a huge ceramic locket ball and chain makes a strong statement on conflicting ideals of parental duty, while also invoking the casual kind of ‘care’ that babies receive in traditional Punch and Judy sketches. It is in this room where reference to the domestic intensifies with a diversity of objects: a washing machine on the floor that is ejecting blood red clothes; the cast fragment of a door implying further scenes of violence; a stove cooking human bodily parts; anthropomorphic speech bubbles on the walls suggest verbal arguments. 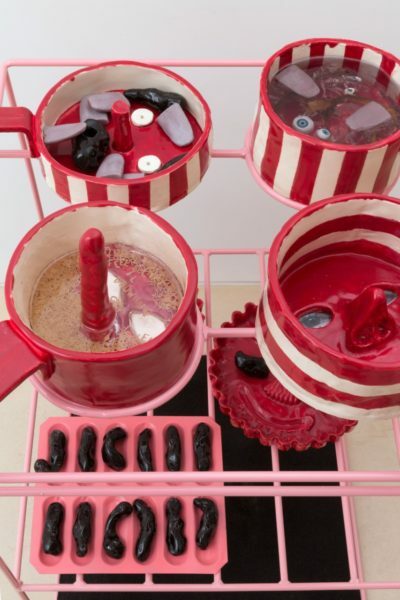 Familiar objects accumulate and become estranged. We don’t have characters but sculptures with a dramatic charge of agency. 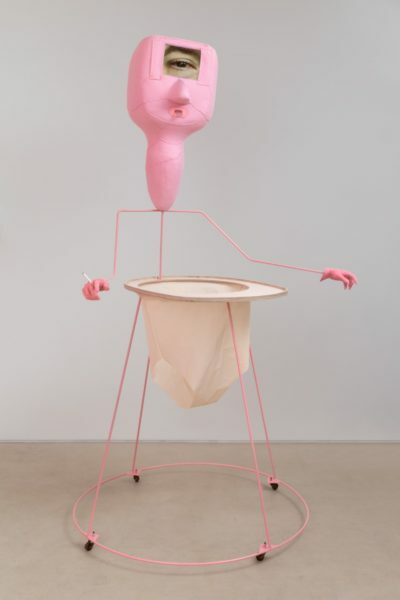 Baldock and Hart’s work is deeply performative in this respect, where artworks stage their own theatrical experience and suggest a series of actions that do not necessarily depend on a viewer’s imaginative agency. Philosopher Bruno Latour has written about the radical aesthetic and experiential shifts that occur when objects are ascribed independent action. Indeed, Baldock and Hart seem to believe that objects and their materiality can be more than creative, more than merely active, but a force for overwhelming destruction. Love Life: Act 1 is a set of a past performance, a balanced account of domestic tragedy staged with unsettling humour and force. And, like the ever-present and often repeated puppet shows that are its inspiration, there are three acts to this play. That’s the way they do it! So we will be richly rewarded by watching their Love Life develop at other places of seaside surrealism, first at Grundy Art Gallery in Blackpool next summer, and then at De La Warr Pavillion in Bexhill-on-Sea next autumn.